The two smaller one's were given to me by my friend beast so they will go on the wall. 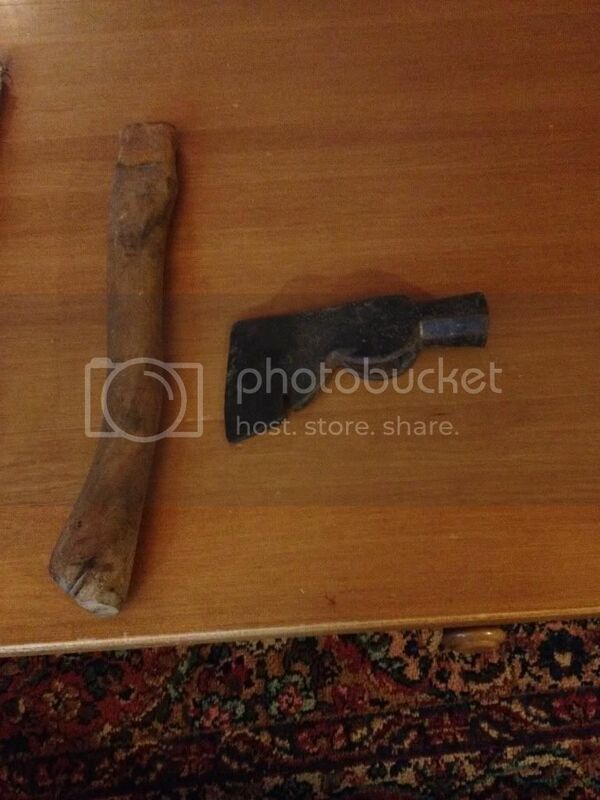 The boys axe is an unmarked yardsale find that I think will make a very good user. All are in good condition. I cleaned the heads some and fitted the handles today. Makes a potent combo. From the perspective of investment and return, there is some time and very little money here. When they are finished I feel from a user standpoint they are very valuable tools. Add a 4 pounder on a 32 or 36 inch haft and about all I could imagine wanting would be a chainsaw. Thanks for looking. I should get them finished tomorrow and I'll update. Those would make a fine addition to my collection, if I had a collection . Looking really good my friend, enjoy them. Yea! 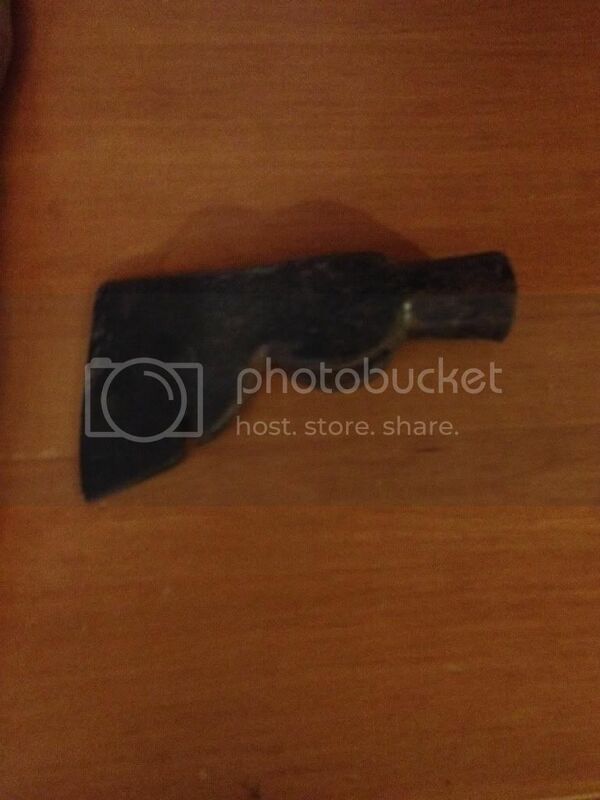 if you had one I figure you might need a carpenter's hatchet for your "non-collection". The real point of the post is to show what some elbow grease will get ya. These were given to me or I paid about nothing. Handles aren't much. You just have to put forth the effort. Although I have the benefit of a few power tools. Everything I accomplished yesterday could have been done with a brillo pad, sharp knife and a rasp. My non-collection would hardly be a non-collection if I didn't already have a carpenter's hatchet. Although this one may need some work. That one would be better if the two parts were connected together! Nice work creek! Those look great from here. I agree I don't think there's a wood chore that those wouldn't cover with ease. Total cost for all three I bet was well under 1 Gransfors, or the like. I don't think people realize just how good you can make an axe with a little effort. You don't need high dollar for great steel and great performance. Creek awesome work as usual! Through the 34 degrees and nasty rain I finished up the trio today. None are particularly collectable but as I stated earlier in the thread, all 3 will make a fine tool. I didn't strive for a extremely high level of finish. I wanted a good solid tool to use. I think they turned out pretty good. They have a nice smooth knob and pretty good grain. I usually break the haft. The haft doesn't break. Good wood to work with unless they enter a beauty contest. Pretty satisfying few hours of work and three new friends to hang out with. I'll need to edge them up a little more to put them into service but all are ready and waiting. That's a sweet combo, Creek. Nice work. Great looking combo, and fantastic work on the re-furb.